Apple finally released a new iPad today. 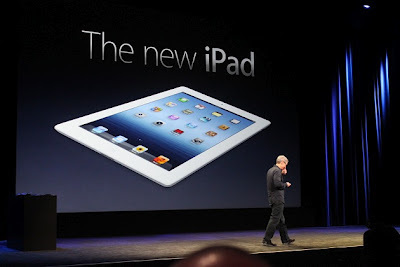 The new iPad presents the same higher resolution Retina Display similar to the iPhone 4 and iPhone 4S. It offers a resolution of 2,048 by 1,536--or 3.1 million pixels. It also boasts an updated processor, which according to the company is too fast for other competitors and it also has a 4G connection. The new iPad's pricing range is same as iPad 2. It costs $499 for the WiFi-only 16GB version, $599 for 32GB, and $699 for 64GB. For 4G, its $629 for 16GB, $729 for 32GB, and $829 for the 64GB version. Apple plans to launch it in the U.S., Canada, U.K., France, Germany, Switzerland, and Japan on the same day. As with the prior versions, the iPads are available in black or white. The latest version has an A5X processor, upgraded from the A5 chip used in the iPad 2 and iPhone 4S. The latest iPad is also the first Apple device to tap into the super-fast 4G LTE network. Similar to many other 4G devices, the 4G-connected iPad will be able to double as a personal hotspot. There would be two versions of the device the iPad compatible with LTE, one for Verizon Wireless and one for AT&T. Both will be able to move back down to 3G in areas where 4G isn't available. Similar to the iPhone 4S, the iPad features a backside 5-megapixel camera that allows for 1080p video recording and image stabilization. The battery life is roughly 10 hours. The device weighs 1.4 pounds. Apple CEO Tim Cook, speaking at the event, said its three post-PC devices--the iPhone, the iPod, and iPad, sold 172 million units last year, which made up more than three-fourths of its revenue. "In many ways the iPad is re-inventing portable computing, and it's outstripping the wildest of predictions," he further added.